Buy Straight From Japan a Coffee. ko-fi.com/straightfromjapan - Ko-fi ❤️ Where creators get paid by fans, with a 'Buy Me a Coffee' button. Thank you for supporting my content creation. 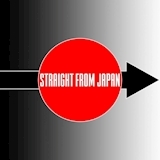 Busy working on the Straight From Japan website as well as running the NECRONOMIDOL English fan site, walkinshadow.com . Look forward to more great content. Secured Payments. Support goes to Straight From Japan's account. Upgrade Straight From Japan to a yearly Gold Membership with a one-time payment.